Whip Scorpions are amazing, but appetizing?... eww, they ate these guys on Fear Factor! Whip Scorpions, Tailless Whip Scorpions (Whip Spiders), and the Short-tailed Whip Scorpions are all arachnids. Arachnids belong in the Arachnida class of joint-legged invertebrate animals in the subphylum Chelicerata. All arachnids have eight legs, and almost all are terrestrial. They look similar to their cousins the scorpions and tarantulas, except their body parts are a little rearranged. They the characteristic jointed legs, eight in number, but they are flattened animals. Whip Scorpions are members of the order Thelyphonida, and are commonly referred to vinegaroons, or vinegarroons. Even though they are not true scorpions, they do resemble them because of their whip-like tails. But are not as big as the largest of the scorpions, they range mostly between 1 to 3 1/3 inches (25 - 85 mm) in length. 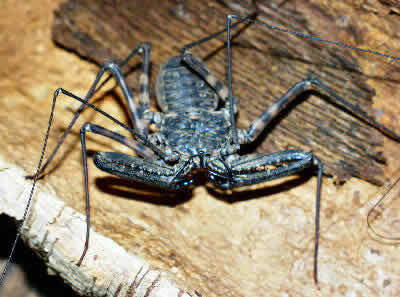 Tailless Whip Scorpions, also called Whip Spiders, are members of the order Amblypygi. The term "amblypygid" means "blunt rump", which relates to their lack of a tail. They are broad and flat, with a solid carapace and a segmented abdomen. They have large, rather pincher-like pedipalps for grabbing prey. Despite their appearance, Tailless Whip Scorpions are totally harmless to humans. The Short-tailed Whip Scorpion are members of the order Schizomida. These are smaller, soft-bodied arachnids that resemble spiders. They are similar to Whip Scorpions in appearance but are much smaller, generally less than 1/5th of an inch (5 mm) in length. These arachnids are mostly tropical in distribution. They live in treetops, rocky slopes, and caves. In captivity they can be kept in a community as long as they are well-fed. Most keepers keep them in small groups of one male and two or three females. The list of arachnids below have guides for different types of Whip Scorpions, Tailless Whip Scorpions, and Short-tailed Whip Scorpions. Each guide provides facts and information and how to keep them as pets. Care sheets includes habitat requirements, foods and feeding, tips for handling, and more.